News » The GW Cancer Center Announces New Mobile Mammography Van in Washington, D.C.
Washington, D.C. leads the nation in both breast cancer incidence rates and mortality rates, according to the U.S. Centers for Disease Control. 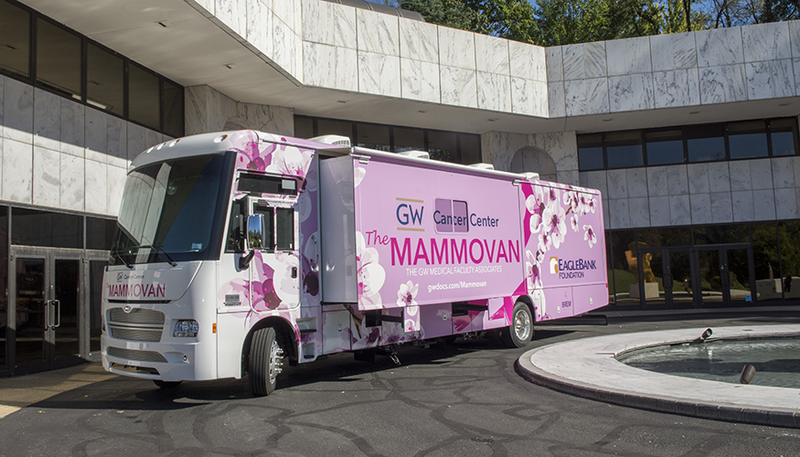 Over the last 20 years, the GW Mammovan has screened more than 36,500 women, bringing life-saving breast cancer screenings to approximately 2,500 women each year. The new GW Mammovan will stay true its mission of making early detection accessible to underserved women, regardless of their ability to pay. The new GW Mammovan has the most comprehensive mammography system available today – Genius 3D mammography technology with the Hologic Selenia Dimensions Mammography System. The van is spacious, warm, and inviting, with three climate zones and individual changing rooms with private waiting areas for maximum comfort. The GW Mammovan was unveiled at the 6th Annual Blush Lunch on Tues., Oct. 17. The event brought together celebrity guest Giuliana Rancic, FOX news correspondent Jennifer Griffin, Congresswomen Eleanor Holmes Norton and Debbie Wasserman Schultz, who shared remarks via video, and those who support the GW Mammovan’s mission to make early detection of breast cancer accessible to all women in the D.C. region. The new and improved GW Mammovan was made possible by local sponsors such as The EagleBank Foundation. To learn more about the GW Mammovan and to support its mission of curable, treatable breast cancer for all women, visit http://supportthemammovan.com/. Media: To interview Dr. Brem, please contact Lisa Anderson at lisama2@gwu.edu or 202-994-3121. Photos and video of the GW Blush Lunch and new GW Mammovan are available upon request. DOTmed - The End of Traditional Mammography?